LED power indicator light. Thumbprint locator. Molded straight blade plug. 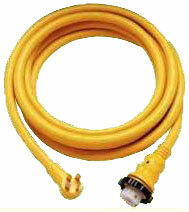 Super flexible 6/3-8/1 cable. Comfort grip connector. Easy lock system. Includes threaded ring and easy lock ring. Water tight molded plug & ends. High quality marine-grade construction.